I started dreaming of Olivia’s first birthday party as soon as she was born! Since I had been taking monthly pictures of her with floral numbers (see previous post), I decided to keep it cohesive and go with a floral/garden theme for her party. My style has always been simple, classy, and clean. 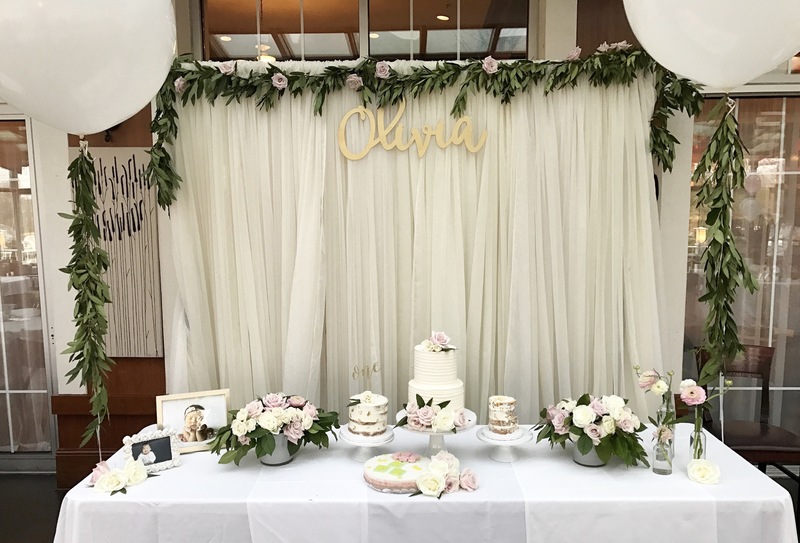 So my vision for Olivia’s party was just that – with a touch of whimsical and pretty. Despite the rain that afternoon, our venue, Jolane’s in Glenview, IL provided the perfect amount of light in their glass-surrounded atrium. The amazing florist, Sara from Vale of Enna, truly made my vision come to life with her beautiful floral arrangements on the head table and cakes as well as her lush bayleaf garlands on the ivory white chiffon backdrop and large, round balloons. Urban Icing made the two-tiered ruffled cake, gold leafed semi-naked cake, and smash cake. Our dear friend and incredibly talented photographer, Chris Kim, captured all of the special moments and details of our baby girl’s big day. The dohljabi guessing jars display, monthly picture frame, wishing tree, decorating, and all of the calligraphy on the signs were done by me. Looking back, taking pictures of Olivia every month was one of my favorite things that I did during the first year of her life. Although it was challenging at times, it was so worth it. (Feeding her cheese puffs and making silly faces definitely helped with getting Olivia to stay still and smile at the camera!) I love that I can see how Olivia grew from month to month in the same context. She grew out of four different white onesies and eventually even started to run out of room on her sheepskin rug! I was so happy with how it all came together! I especially enjoy seeing Olivia’s personality come out during each month. The frame also fit in perfectly with the rest of her first birthday party decor. For Olivia’s very first Christmas present, I knew we just had to get her a play kitchen! I loved how adorable this KidKraft white vintage play kitchen was, but I wanted Olivia’s to be more elegant and chic. With a little bit of styling (for not too much money! ), I was able to transform some of the elements to get the look that I wanted. I spray painted all of the hardware (originally silver) with Rust-Oleum metallic gold. I would recommend doing a few thin coats with plenty of drying time in between. Just to be safe, I also sprayed a thin coat of Rust-Oleum clear matte finish as a topcoat, to prevent scraping or peeling. To get the “marble countertop” look, I covered that one piece with a self-adhesive vinyl film. When it was all ready to go, my wonderful husband, Phil, assembled it and put it all together!